Bare Bones Border Morris started in 1985 following a meeting of a group of friends in the pub who thought it seemed like a good idea! After an initial practice period the side first danced out in public in summer 1986 and is still going strong. Many people have come and gone over the years but there are still a few original members. The repertoire of dances has increased as members of the group have devised new ones but the kit we wear is still essentially the same as that originally worn. 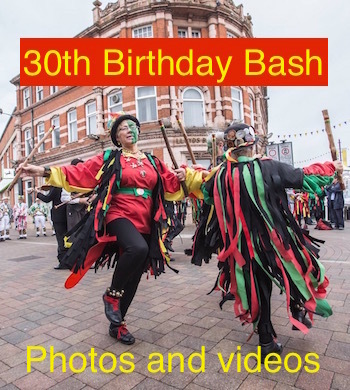 We have danced at festivals and events all over the country and have also danced in Loughborough's twin towns, Schwäbisch Hall in Germany and Gembloux in Belgium.